Things to do in Chattanooga, Tennessee! Most of our cabins are located on top of Fort Mountain, just 45 minutes from Chattanooga, Tennessee. 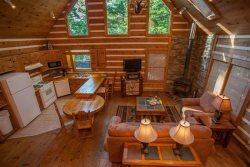 Enjoy a stay in our secluded cabin, then drive to the city for the day and explore all the exciting activities located in the area! The primary tour through Ruby Falls is a guided tour to see the magnificent 145-foot underground waterfall. Your tour guide will point out various formations and cave facts along the way. Ruby Fall`s Cave tour is one of the most popular attractions in the South East! Chattanooga adds an adventure above the rest with a never before seen view of the Scenic City from the tree tops at Ruby Falls. This challenge is made up of suspended obstacle courses built in the trees that include ladders, nets, walkways, bridges, tunnels and zip lines! In addition to the Orange, Green, and Blue Diamond Courses already at ZIPstream, the Tower ZIPRide offers guests a zip line experience without the ropes course elements. That`s 700 feet of round-trip zipping! The three-sided, 40-foot Climbing Tower is also new onsite, with five routes of varying difficulty. Looking for a unique view of Chattanooga? Take a ridge on the Incline Railway, also known as "America`s Most Amazing Mile." Near the top there is a 72.7% grade, making The Incline one of the steepest passenger railways in the world. Also just a short walking distance away are many points of Civil War interest, including the site of the Battles for Chattanooga Electric Map & Museum and Point Park. You can also visit the Centennial Photo Exhibit and engine room. Come see for yourself why visitors like you have rated the Tennessee Aquarium the best aquarium in America for 3 consecutive years, located right in downtown Chattanooga! Enjoy a remarkable journey with 10,000 animals. Then, let relax in the aquarium`s IMAX 3D movie theater with a screen six stories tall. Rock City will amaze you, especially with the views! Located atop Lookout Mountain, just 6 miles from downtown Chattanooga, Rock City is a true marvel of nature featuring massive ancient rock formations, gardens with over 400 native plant species, and breathtaking "See 7 States" panoramic views. Take an unforgettable journey along the Enchanted Trail where each step reveals natural beauty and wonders along the woodland path. Experience the magic of Fairyland Caverns and Mother Goose Village, visit one of the regional gift shops and dine at the Big Rock Grill. Rock City is splendid year-round - "Each season there`s a new reason to visit!" Creative Discovery Museum is one of the top children`s museums in the country. The Museum fulfills its mission through permanent and temporary exhibits and an extensive array of education programs, open 7 days a week. The Chattanooga Market is held each Sunday/Wednesday (April - November) and named one of Frommer`s top 10 public markets. Take a great Chattanooga cruise along the scenic Tennessee River while enjoying one of our fabulous dinner cruises, daily lunch cruises or daytime sightseeing cruise. This is a vacations experience you won`t want to miss! Coolidge Park, located on the city`s North Shore, is one place where you can overlook the beautiful Tennessee River, play in an interactive water fountain, stroll across the world`s largest pedestrian bridge-the Walnut Street Bridge, test your skills at rock climbing, picnic with your family in plenty of open green spaces, admire a military memorial and even ride a tiger on the 100-year old restored antique carousel. Coolidge Park is adjacent to local entertainment, art galleries, shops, and restaurants and serves as a venue for numerous concerts, festivals and special events. It is also part of the Tennessee Riverwalk, a 15-mile long public greenway that runs along the Tennessee River - from the Southern Belle Riverboat to Chickamauga Dam. In 2006 The Peace Grove was added to Coolidge Park. It is a circular landscape of trees planted to represent each of Chattanooga`s Sister Cities and celebrate the city`s global friendships around the world. It`s a safe bet that the Chattanooga Zoo will be a crowd pleaser with red pandas, monkeys, jaguars, a petting zoo area and camel rides (on the weekends). Upgrades available to get a little more up close and personable with the animals! New in 2014! High Point Climbing And Fitness is one of the most unique climbing facilities in the nation, offering climbing inside and outside. The outdoor climbing walls feature transparent panels which are backlit with a custom LED lighting system. There are lead, top rope, and auto-belay walls, as well as a 15 meter speed climbing wall. Climb while enjoying views of wonderful Chattanooga right over Broad Street! From beginner auto-belay walls to our top roping room, lead climbing pit, and two boulder areas, there are climbing areas for everyone. There is even a campus, moon, and adjustable wall.